I am back with more Easter cards for this week's craft post. Last week I showed you three simple "cute" cards, but this week I have to show that are more inspirational or adult-like along with a more complicated shaker card. 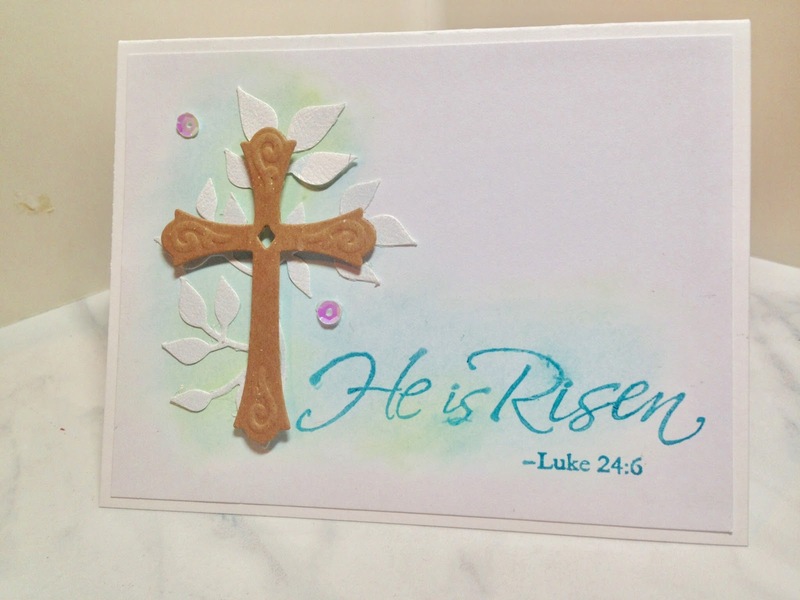 This inspirational Easter card looks simple, but involved a little bit of tedious work. 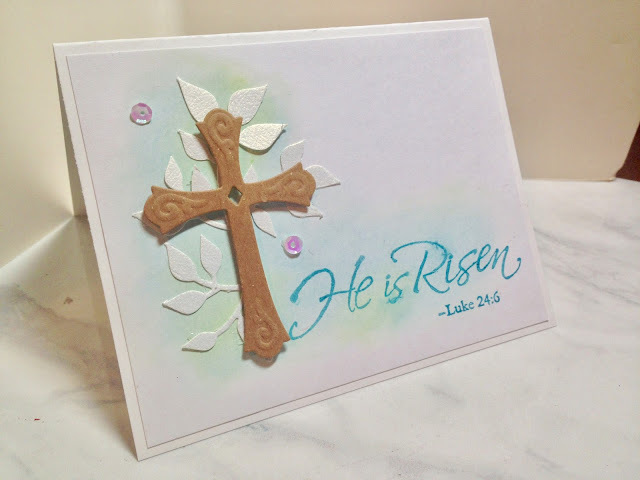 The cross was cut out of kraft paper with a Spellbinder die and mounted up on dimensionals. 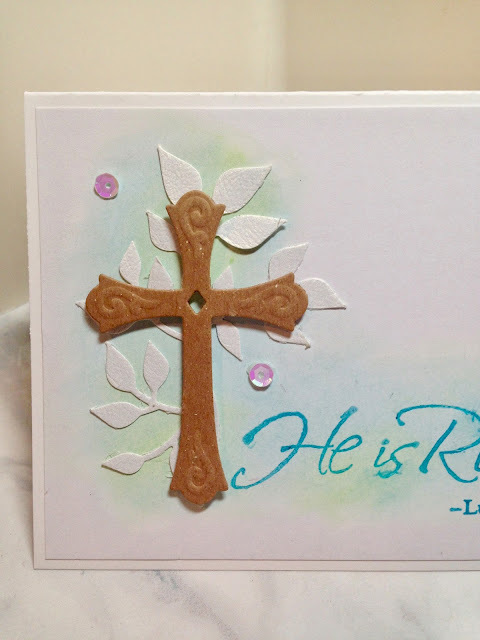 The white leafy die behind the cross is a old Sizzix die. I know most paper-crafters today use water colors to create their backgrounds, but I prefer gelatos. They are so much easier to work with and create a very similar water color look. If you don't know what a gelato is, it's basically a gel crayon. To create this look I just rubbed the gelato onto the white card stock and then smudged it a bit with a blending sponge. I used two different gelato colors to create this look. 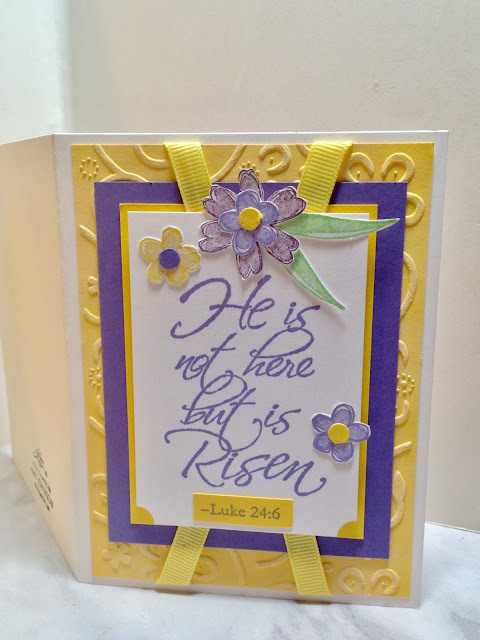 The sentiment came from an old Stampin' Up! set. I added a few sequins for embellishment. My next two cards are what paper crafters call "Catty Cases". 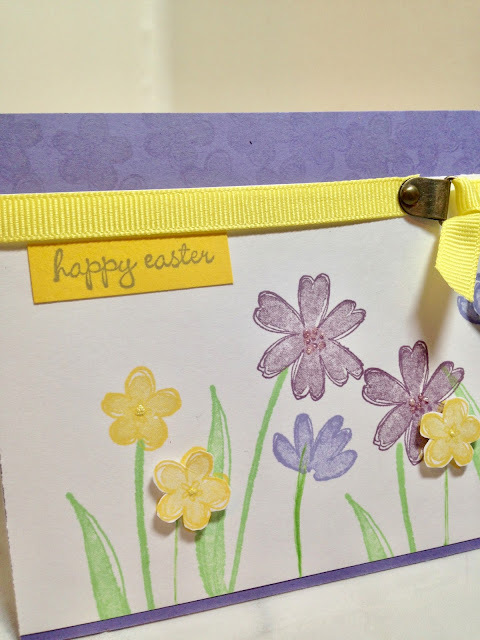 It means, I just saw the design in the Stampin' Up catalog and copied it using my own papers and supplies. 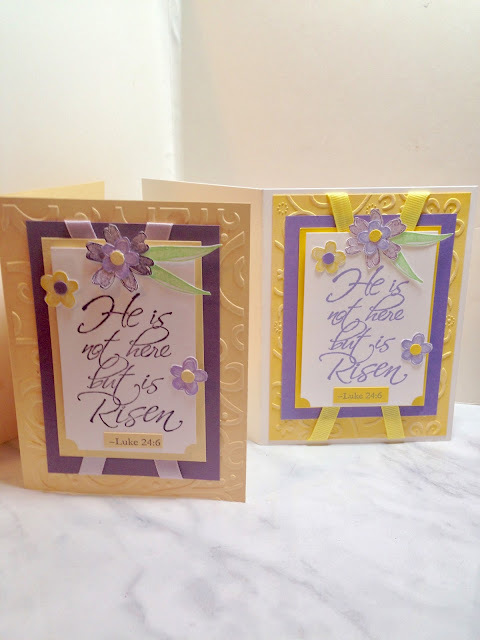 All the images in these cards come from the retired Stamp set "Glorious Gift" from Stampin' Up. The flower images also came from that set. I stamped them and fussy cut them out. The yellow embossed part of the card was done with a Cuttlebug Embossing folder. Using just the flower images from the same "Glorious Gift" set, I created this "Catty Case" card. The outside sentiment is a stamp from another set. I stamped and fussy cut out a few of the flowers and mounted them up on dimensionals. Stickles were placed in the center of the other flower images. 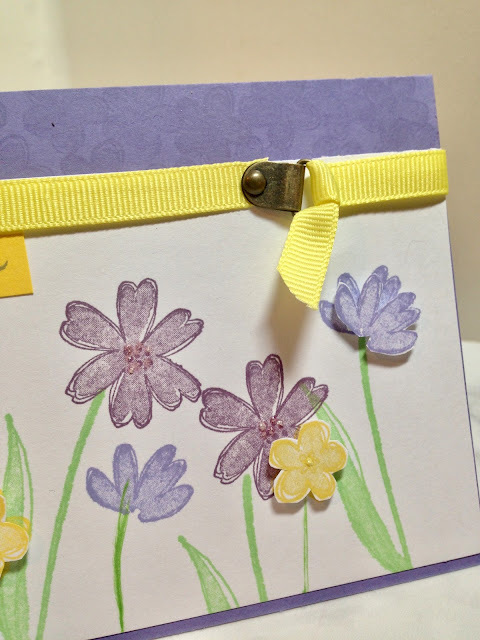 I tied the ribbon to a piece of Stampin' Up! hardware just like the "Catty Case". 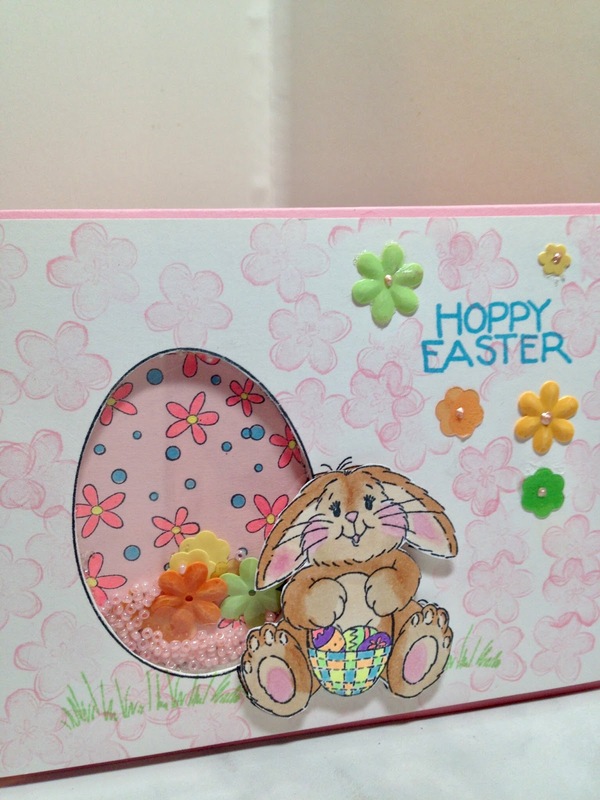 My last card is a shaker card that I made for my granddaughter. I think she will get a kick out of it, but hopefully she won't pull it apart to try to get to the stuff inside. Knowing her curious nature, she probably will! Shaker cards are a lot easier to make than they look. There are a ton of tutorial videos to google if you want to give one a try. I had to watch one myself to refresh my memory! You basically just need a piece of acetate (or hard plastic) and anything small to put inside to create the shaking effect. I used sequins and tiny beads. I stamped the egg background first on pink card stock. Then I cut an egg shape out of white card stock, mounted it up on dimensionals, and put it over the egg background after placed the sequins and beads inside. 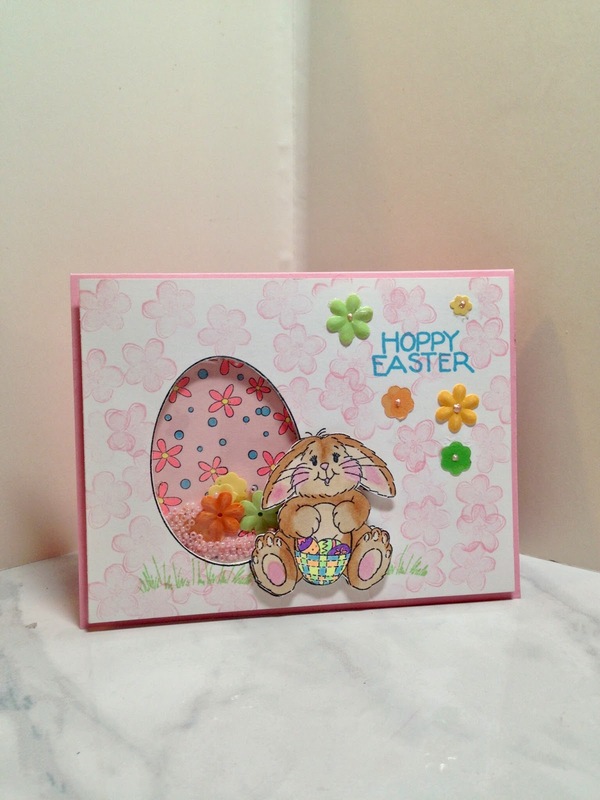 The cute bunny was stamped, fussy cut, and glued on to the shaker card. 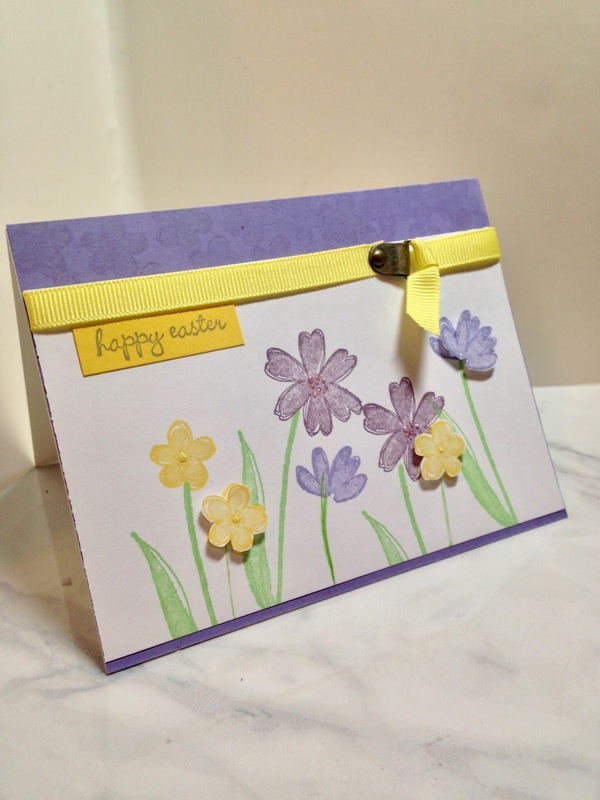 I lightly stamped a flower image over the white card stock to create a background. A sentiment and more sequins with Liquid Pearls finished the card. Well, after all the work I put into these cards, I don't know if I will even send them now. I planned to mail them last week, then we got hammered with a winter storm making me housebound for two days. Now I won't be able to get to the Post Office till late Thursday afternoon, which might be too late to mail Easter cards. 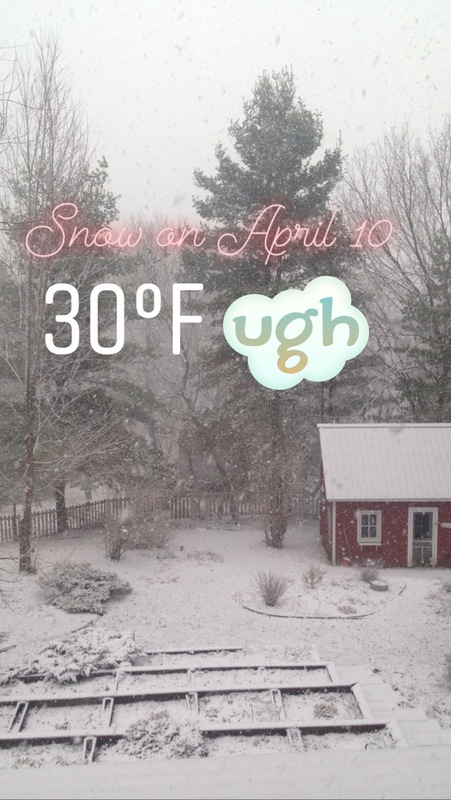 Oh, spring in Wisconsin...non existent! 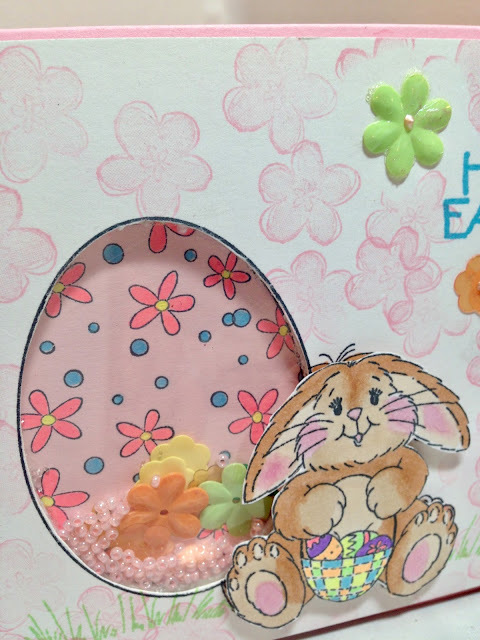 Labels: card making, Easter, Easter Cards, paper-crafting, Stampin' Up! Such pretty Easter cards! I can't believe Easter is this weekend- April is flying by! I learned something new today! I was confused why you said gelato and when I read further what it was about it then it made sense! These cards are really beautiful. Your granddaughter will really love the one you made her and I want to try to make a shaker as well. I scrapbook and think this will be a fun adding in my son's section. Thanks Maureen. Yes, gelato is also a form of ice cream, I thought I'd better explain it because I have a lot of readers that don't craft much and may not know what a gelato is. Such wonderful cards Amy. Love how you used gelatos. I usually use mine only when doing some mixed media project, but don't do that very often. Will have to remember to reach for them more often! Thanks Ellie! I saw all the snow you guys got. Ours is almost gone too, but it's still cool outside. I just want the weather to get warm and STAY warm! Lovely cards! Happy Easter Amy! Thanks Carmen! Happy Easter to you too! Lucky, lucky folks on the receiving end of your beautiful cards, Amy. Love the shaker one. I have used similar acetate plastic 'windows' in scrapbooking to fill with mementos or keepsakes. That bunny reminds me of your grand baby and mine. Just a little chubby and a whole lot sweet. I had an embosser and never used it enough to feel comfortable with it. Think I still have the embossing iron or tool to heat with. But have also used something like the cuttlebug and think I remember that being easier. Can't remember how you do that though, now. I scrapped today but when all was said and done, I didn't like the pages I created. Need to just move on to the next pages. I over think everything too much!! Thanks so much Leslie! The dry embossed card was made with the Cuttlebug. It is a very easy machine and I prefer it over my Cricut too! These are lovely. I love the first one - "He is risen!" I can't believe you got snow in April. That's crazy! I hope it has warmed up for you now, and that you had a wonderful Easter. Thanks for sharing! Thanks Amy! Yes, it has warmed up a bit. In the 60's today! These cards are sooo adorable dear! Happy Easter! These are sooo adorable Amy! 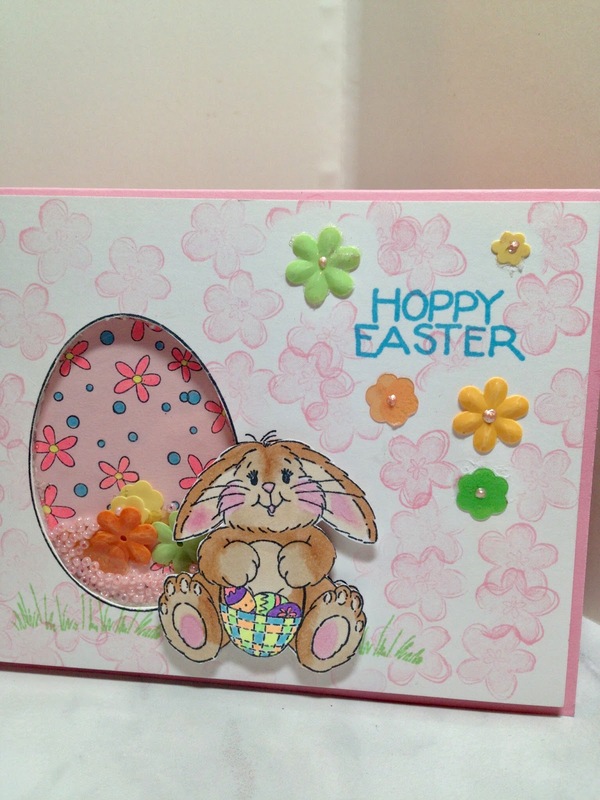 Especially the one with the bunny, such a cute card.